Also known as Northern Catalpa. Grows 40 to 60 feet in height. Spread 20 to 40 feet. Medium green heart shaped leaves are often 12 inches long. 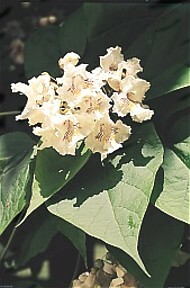 Flowers that are creamy white, with yellowish and brown markings, bloom in late June. In late fall, long bean-like pods appear that reach 18 inches in length. Grows best in rich, moist soil but will tolerate an average dry soil. Attractive as an ornamental but also when grown in rich moist soil, hardy Catalpa produce more good fence posts in a shorter time than any other native tree.